Read Pippi’s story in Anna’s words. Anna Green needed a knitting assistant, and nothing fills that role like a cat. 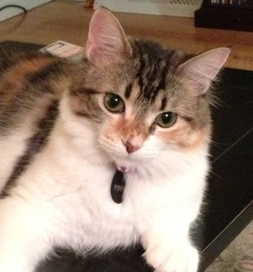 The Grand Rapids, MI, woman had recently lost her feline companion, Daisy, to a heart attack. Without her to lie on the pillow next to Anna’s head and sprinkle kitty kisses on Anna’s face each morning – not to mention the loss of someone to grab at Anna’s knitting needles and play with a ball of yarn – well, life just was not as sweet. “I started to browse for cats on Petfinder,” Anna says, “and saw a picture of Pippi at our local animal shelter [Kent County Animal Shelter in Grand Rapids].” She told friends and family she was just going to make a little visit to the shelter to look at Pippi, but certainly wasn’t going to adopt a cat so soon after Daisy’s death. But Pippi, then called Cali, needed a home, and how could Anna just walk away? She couldn’t. Though she calls Pippi “my naughty new family member,” she’s once again enjoying all the joys that go with cat parenthood – including a knitting assistant.